Cairns is considered the gateway to Australia's Great Barrier Reef. Once a sleepy sugar-milling town, it's now a destination for sailing, diving and snorkelling. Cairns Esplanade, lined in bars and restaurants, has a saltwater swimming lagoon. Explore the Waterfalls and hikes around Cairns, We're really lucky that there are some beautiful waterfalls very close to us. For example Barron Falls and the Crystal Cascades (don't forget to bring towels) are both very nearby. If you don't fancy hiring a car then get the bus to a lot of places. Cairns Art Galleries, Cairns has a surprising number of art galleries. When you're thinking of Cairns it's not the towns art and culture that first pops into your mind, but surprisingly there is quite a lot to see. The Art Galleries are free to get in because they want you to buy something and you'll see some spectacular images of Cairns, The Great Barrier Reef and also images of some of the places you'll have visited during your time in Australia. Because there are quite a few art galleries, ranging from indigenous art to contemporary art there's pretty much something to suit everyones tastes. Check out the markets, Like many towns in Australia, there are some great markets in Cairns, my favourite being the night markets in the city. For cheap fruit and veg make sure you visit Rustys Markets - it's cheap, smells amazing and there's enough fruit samples to easily provide a healthy and free breakfast! Port Douglas Markets are popular with Cairns tourists who can find a wide variety of items from vendors located throughout Far North Queensland. Open only on Sunday mornings, visitors can find everything from handcrafted jewellery to fresh coffee. Located near the Coral Sea, the Port Douglas market is well worth scheduling into a Cairns vacation. Kuranda, Kuranda, a beautiful village hidden by tropical rainforest, gives you a chance to delve into an arty Queensland community. Fig trees line the main street while colourful parrots and butterflies flock among ferns and orchids. You’ll find galleries, market stalls and boutiques to occupy your time. Mossman Gorge, Around 90-minutes north is the Mossman Gorge Centre, an eco-tourism development that allows visitors to explore the gorge while learning about the local Kuku Yalanji culture. Check out the Rainforests, If you want to check out our beautiful rainforest there are some excellent options. Explore Australia’s largest continuous area of tropical rainforest, the Daintree. Hidden in the diverse range of lush vegetation you’ll see a wide variety of rare creatures, like the tree-dwelling kangaroo and the endangered cassowary. Gentle cruises down the Daintree River are a great way to relax, especially if you’d like to go crocodile spotting. The Botanical Gardens in the city is the quick and easy version of a rainforest or even better, near to the Botanical Gardens is the entry to the 'Red Arrow', which is a small nature walk (there are other arrow walks you can do too). The Red Arrow walk takes only about 30 minutes to complete and will take you through the gorgeous rainforest to a spectacular lookout at the top, make sure to take your camera. A good thing to know; the entry is free. The Great Barrier Reef, No visit to Australia is complete without a visit to the world famous and world heritage site of The Great Barrier Reef and Cairns is an excellent place to be to get on a boat and see it for yourself. But how on earth can a visit to The Great Barrier Reef out of Cairns be considered a free or cheap thing to do in Cairns? The first option depends on what your definition of cheap is, but you can book yourself on a day trip to The Great Barrier Reef from as little as $99AUD. Our recommendations are Compass Tours for the outer reef and Green Island for the inner reef. Visit Cairns Museum, Why not try and learn something about Cairns and the surrounding area of Northern Queensland? For around $5AUD you can visit Cairns Museum and inject a bit of culture into your trip. 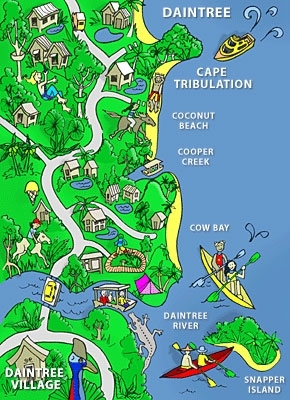 Visit the Daintree Forrest and Cape Tribulation, for $26 you can take the ferry which will take you to the most beautiful Rainforest with beautiful coastal roads, sugarcane fields and rainforest covered mountains. Explore ancient rainforest and pristine coral gardens. Tjapukai Aboriginal Cultural Park tells the stories of the indigenous Aboriginal and Torres Strait Islander people with music and dance. The Skyrail Rainforest Cableway takes you high above the rainforest canopy for 90 minutes, allowing 360-degree views as you soar over 500 metres (1640 feet) above sea level. On your way back to Cairns, you can travel on the equally impressive Kuranda Scenic Railway, to complete your experience of these iconic attractions. This historic two-hour train journey, operating for over a century, takes you through the lush region, taking in dramatic mountainous scenery and teeming waterfalls. Extreme sports, Find some of the best white-water rafting rapidsin Australia on the Tully River and Barron River, or try a half-day of tubing on the Mulgrave River. Tandem skydives are available for the true adrenaline seekers — with the aerial view of the Great Barrier Reef an obvious draw — as is bungy jumping at AJ Hackett’s (where you can also ride their Minjin Jungle Swing). Other activities in the area include quad biking, horse riding and hang-gliding as well. Island hopping, Island Exploring Discover some of the reef’s unspoilt islands. Jump on the Fitzroy Fast Cat in Cairns for 45 minutes and you’ll reach Fitzroy Island. Here, you can explore the bush walking tracks or learn about the dedicated work of the Turtle Rehabilitation Centre – helping sick and injured turtles recover enough to be realised back into the wild. Make the crossing to Green Island, a coral cay less than 30km off the shore, for snorkelling and diving all year round, as well as helmet diving that lets you walk along the sea floor. For an ‘off the grid’ adventure, visit Hinchinbrook Island, Australia’s largest national park island. Largely uninhabited, you can cruise through mangrove everglades or find isolated beaches (there are 11 of them around the island). The Cairns Tropical Zoo, gives visitors more than a glimpse into our native wildlife of Far North Queensland. Zoo guests are welcome and encouraged to interact with the wildlife of the zoo. Snakes, birds, koalas, kangaroos, and crocodiles are just some of the animals that zoo visitors can view, touch, and even feed. An entire day can easily be spent at this location, as there are numerous programs scheduled from 8:30am until the zoo closes at 5:00pm. After hours, a section of the Cairns Tropical Zoo turns into Cairns Night Zoo, and entirely different experience that should be considered when planning any Cairns vacation. Cairns Tropical Zoo is about 20 minutes north of Cairns. Those who have hired a car should have no difficulty finding the zoo, though buses also travel to the attraction. - פארק ממש יפה ליד הים עם שקיעות אששש!